One of the first things most people recognize about martial arts is the use of colored belts to denote rank. While today belts are used by almost all schools, they are a very recent development in martial arts history. There are in fact two separate ranking systems, kyu (student) ranks and dan (master) ranks. Both systems were introduced to martial arts by Kano Jigoro, the founder of modern judo, in the 1880s. The rankings were borrowed from Go, a strategic board game, though the system is now a common way of ranking practitioners of everything from games to flower arranging. Gichin Funakoshi followed Kano’s model when he formalized modern karate, awarding the first black belts for karate in 1924. From there, other styles began adopting the system, seeing it as a way to formalize the training process and to give students something to work toward. Originally, the ranks did not correspond to colored belts. Beginners were given white belts and masters were given black belts, with nothing to distinguish the intermediate steps. Eventually many martial arts began using colors to differentiate various kyu ranks. There is no universally accepted meaning for belt colors, just as there is no universal standard for advancement, but some general principles are common to most forms of martial arts. The white belt can symbolize innocence or birth and is given to students who are just starting out in martial arts. Yellow belts (and orange in some styles) symbolize sunlight falling on a seedling just as knowledge of the martial arts has begun to enter the student’s mind. The green belt represents a sprouting plant. 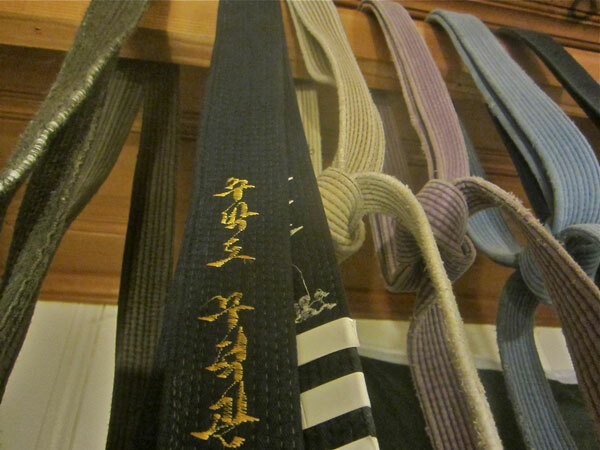 A student with a green belt has begun to grow toward his or her goal. The blue belt represents the sky, indicating that the student is now focused on growing beyond his or her current limitations. Some styles use purple belts to symbolize the changing color of the sky at dusk or dawn. The attainment of this belt signifies that the student has changed in both knowledge and focus, and is now beginning to work toward the black belt. The brown belt represents maturity, often being likened to the colors of the harvest season. The red belt represents the heat of the sun, as students who attain this belt are approaching the end of their time. The black belt is the end of the kyu ranking system and the beginning of the dan. Thus it is the inverse of the white belt, representing the end of one journey and the beginning of another. It is also said to represent the void beyond the sun, as the holder of the black belt must advance beyond what is commonly known to expand the field of martial arts. With the attainment of a black belt, the martial artist can now begin to teach others what he or she has learned. Most people, especially those not familiar with martial arts, think of a black belt as the highest rank attainable. In fact, it is just the beginning of another ranking system, the dan rank. Like kyu, dan ranks were adopted from the system used by Go players. The number of dan ranks available is different in each style, and their progression is much slower and vaguer than progression through kyu ranks. Where kyu ranks are generally awarded after passing a standard test, those seeking to advance in dan rank are expected to display exemplary personal characteristics and make positive contributions to the martial arts community. The ranking system is sometimes controversial. Acquiring certification in new ranks can be very costly, with some dan certifications costing upwards of $1,000. Critics have said that some schools use the ranking system to financially exploit students by requiring many expensive lessons to rise in rank and charging large fees for certification. It can be difficult for someone inexperienced in martial arts to tell the difference between a legitimate school and a fraudulent one. 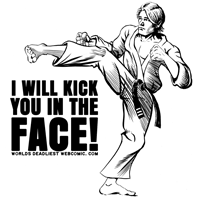 The term McDojo has been applied pejoratively to schools that exist solely to collect testing fees without teaching its students anything of real value. The focus on external signifiers like belts can also be seen as against the spirit of the martial arts. Kept in perspective, a rank and belt can be useful as reinforcement of a student’s ability and the hard work that the rank took to earn. But it is easy to lose sight of the meaning behind the rank and think of a belt as a goal in itself. This distracts from the true benefits of martial arts study, which are much more personal and intangible. Defenders of the belt system say that belts can give students something tangible to work toward. Acquiring a new belt can be a way of boosting confidence and focus, which are major goals of any martial art. They can also be used to quickly discern relative levels of achievement within a group of students, making it easier to organize lessons and choose sparring partners. At this point, belts are so ingrained in our understanding of martial arts that they likely could never be removed completely. Perhaps the best purpose they serve is to draw people into martial arts in the first place with the allure of advancement and recognition. Once students begin rising through the ranks, they may start to see that the belts are only a symbol, and that what they gain from martial arts is much more than a simple trophy. About the Author; Bryan Lawver is a writer and editor in Boston, Massachusetts. He primarily writes about art and artists but has dabbled in fiction as well. Some of his work can be found at bryanlawver.com. Segarra Daniel. Secrets of the Warrior-Scholar The Origin of the Belt Ranking System. “Http://www.warrior-scholar.com N.p., n.d. Web. 27 Feb. 2014. Fujimoto, Kenji. “The Fujimoto Family Joins the Ikebana Ascendancy. “Http://www.erepublik.com. N.p., n.d. Web. 27 Feb. 2014. “How the Masters Got Their Ranks: The Origins of Karate Ranks.” Http://judoinfo.com/. N.p., n.d. Web. 27 Feb. 2014.